We’re headed towards our Memorial Day long weekend in the USA, the official unofficial start of Summer. The last two weeks have been very soggy wet ones in South Florida, and all up the Eastern coast for that matter. There are reports of lots of flooding (not great for the agriculture industry) and tons of humidity with mid-80°F temperatures (~30°C). We really needed the rain, but it can stop already! On Saturday Robert and I are also celebrating our 45th wedding anniversary with a nice staycation and an evening out at one of our favorite local restaurants. Really looking forward to that. 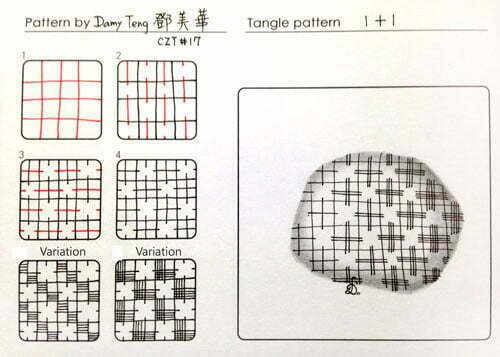 Today Taiwan CZT Mei Hua Teng, or Damy as we know her, is back with her 1+1 tangle. This one is amazingly versatile, so many many options and Damy shares several tiles as examples. 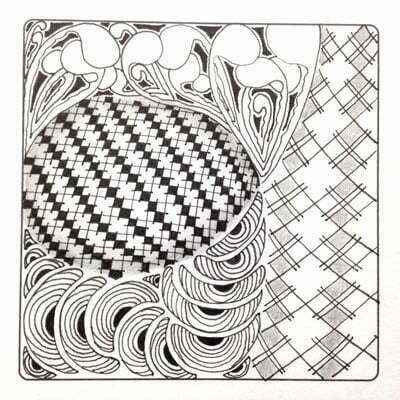 The first tile also features the Zentangle®-originals Mooka and some Crescent Moon-filled Molygon. 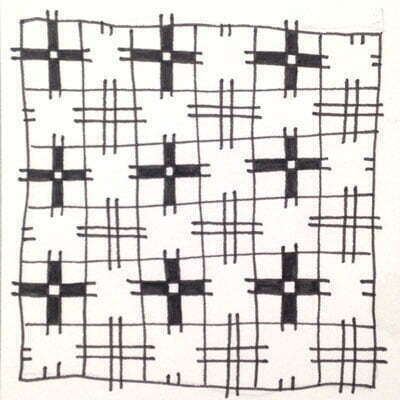 1+1 is a design inspired by an embroidery pattern. You can try combining a different number of cross-stitches. It’s cool how our eyes see “ghost circles” where the strokes approach each other in the center of each grid square. Or if you’re not particularly precise making your strokes/stitches equal in length, as in my graduated example on the right, you might see ghost star shapes. Damy illustrates the step-by-step instructions for drawing 1+1 below where she also features just a few of the potential variations for you to explore. Using colorful stitches is another interesting ZIA way to experiment with 1+1. Ooooh, I see the ‘ghost circles’, very cool. Love this pattern, simple but effective! 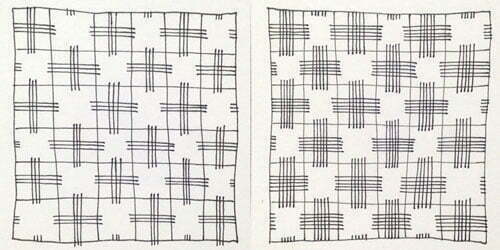 You know when I first saw this pattern it looked too simple, but then when I saw all the variations and experienced those “ghost” shapes, I saw lots of possibilities! I will be trying this one out for sure! Love it so much !! Thank you ! Damy I love your 1+1. I did not see the ghost circles at first and then they just popped! Cool. I am doing this tonight. Thank you Damy! Happy 45th Anniversary to you and Robert for today, Nancy! How cool that we’re 2 days apart. Lilac time! Thanks so much for your lovely wishes too, most appreciated. Very cool, and so simple! Thank you, Linda and Damy! Thanks Damy for another fun tangle. And a very Happy 45th Anniversary to Linda and Robert. Have a wonderful day on Saturday. Easy & fun with so many variations! I discovered this tangle does take focus though … ? I love this tangle! the “holes” that the lines create are mesmerizing! I’ve been using it a lot!